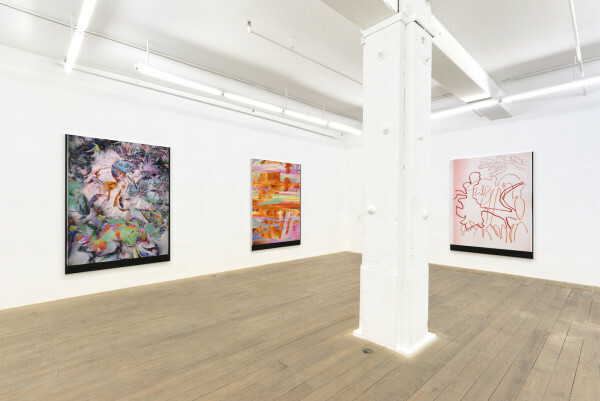 Travess Smalley’s inaugural solo exhibition at Foxy Production comprises large-scale print works, a five-volume book of images, and a short story. Blurring distinctions between process and product, and between analog and digital, Smalley confounds viewer’s certainties about optical perception. Smalley creates a web of mediated images that speak to the contemporary dilemma of digital preservation and transfer: to the aesthetics of loss and corrosion. Each work in the exhibition is a composite image that has undergone a series of actions, including cutting, drawing, photocopying, printing, scanning, Photoshopping, collage, or stenciling. 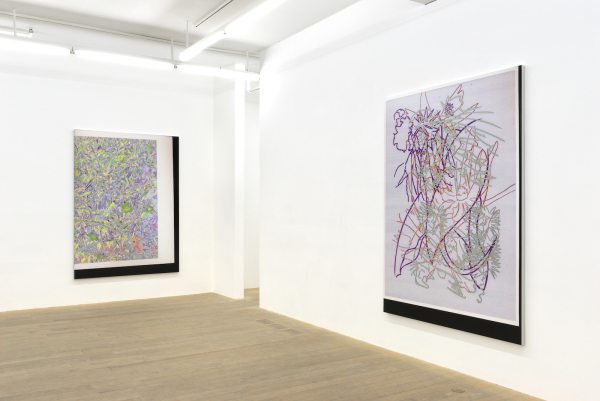 Printing and scanning are central operations to Smalley’s practice: they act as portals between his analog and digital activities. 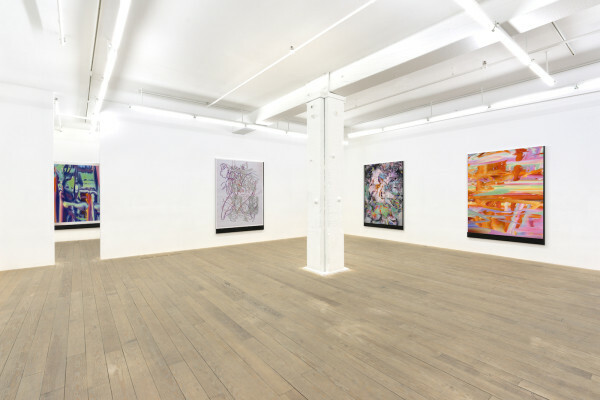 The works’ final realization combines changing perspectives and a vibrant, sensual palette that recall a range of influences, including Internet graphics, Structuralist film, and textile design. 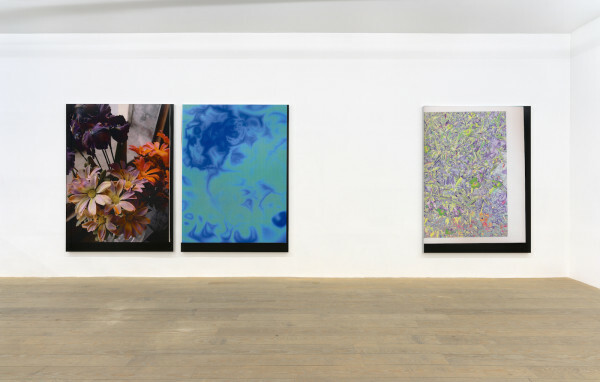 Smalley’s large inkjet prints mounted on aluminum are vividly hued combinations of abstractions and images of flowers. 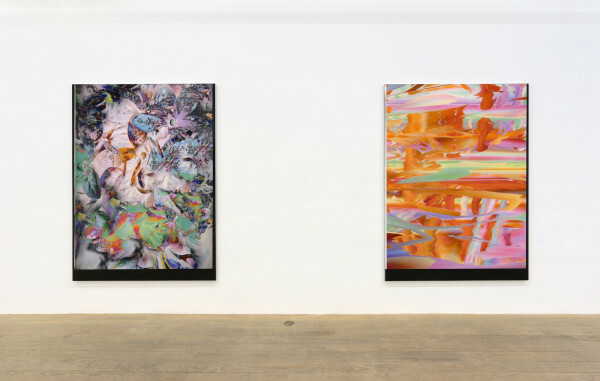 Exhibited either singularly or as diptychs, their high-resolution pulsating colors and forms leave the viewer’s experience of content, texture and perspective in a state of flux. They resemble paintings, silk-screens, photographs, and misaligned scans, and bring to mind a range of art-historical associations, including still life painting, Abstract Expressionism, and Pop Art. The artist has produced an artist’s book, comprising 1,384 drawings, that acts as a recording of programmed transformations upon images compiled over the last few years. The book, as a data archive, is a testament to the enormous breadth and depth of his creative project. 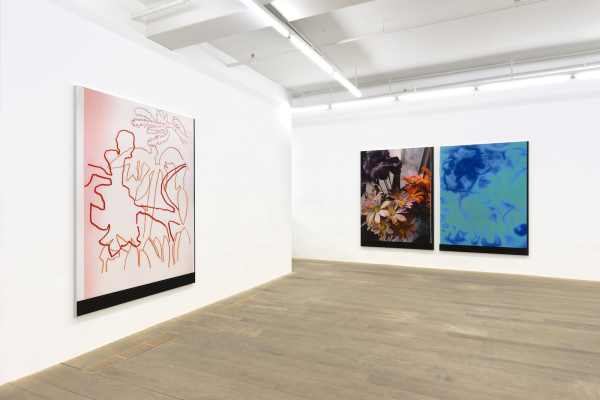 Smalley’s short story, Bloom, brings together many of the themes of the exhibition. Set in the future, it dramatizes problems with digital storage: with the plethora of images people now collect and the effects of data corruption on a subject’s identity, drawing is seen as a means of data collection. The entry 'Travess Smalley' was posted on June 18th, 2015 at 1:45 pm	and last modified on June 18th, 2015 at 2:30 pm, and is filed under Uncategorized. You can follow any responses to this entry through the RSS 2.0 feed. Both comments and pings are currently closed.